Is it just creepy, or is there a wider purpose? The Night King has sent a message, and it comes in the form of a dead young boy, hung up with some dismembered limbs around him. It's a striking, horrifying image that comes close to the end of the Season 8 premiere, Winterfell, but is also a familiar one too. For as long as there have been White Walkers on the show, there have been these strange spiral patterns. 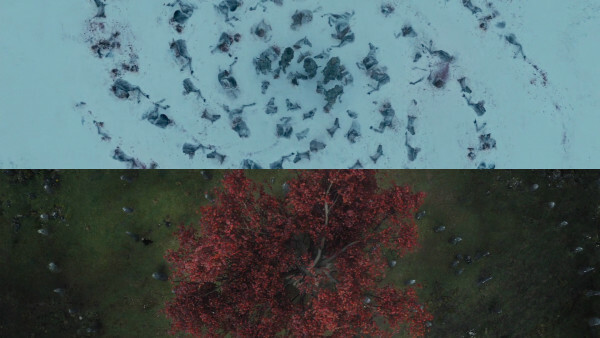 The first one came in the pilot episode's cold open, where we saw the Walkers had arranged the bodies of wildlings into one of these patterns. It then re-emerged in Season 3, after the massacre at The First of the First Men, before appearing in a new context in Season 6. There, it was in one of Bran's visions, right before the Children of the Forest created the Night King. 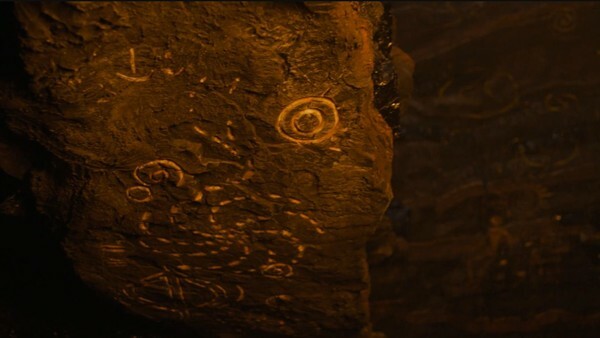 It later appears in the cave drawings the Children made on Dragonstone, and showrunner David Benioff has confirmed it originally belonged to them. So what does that mean for its true purpose? On the one hand, it might not actually mean a huge amount - at least, not in the way the White Walkers use it. Whenever we've seen them leave it, it's always been after an attack. There's evidence they like to leave someone behind (see: not killing Sam), and this is another part of that methodology: it's a calling card, and a warning. That it originally belonged to the Children of the Forest only adds to this. The Children created the White Walkers as a weapon, and there's reason to believe that they're so intent on death as a means of revenge for that, meaning that their use of the Children's symbol - which may have been something far more peaceful - has been co-opted as a signal of death and destruction, which is quite fitting. 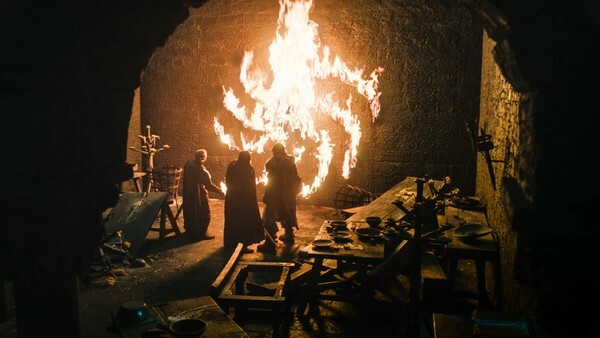 There are other theories too, which are likely to intensify after this episode, because the symbol when aflame here does look like the sigil of House Targaryen. Does this mean the Night King is yet another secret Targ and that's why he can ride a dragon? Probably not, no, since the Children of the Forest, and events such as The Pact and The Long Night, pre-date Targaryens by thousands of years. Likewise, the idea of the symbols having seven spokes has been speculated to connect to the Seven-Faced God, but given the lack of correlation between them, it again doesn't seem likely (seven is an important number in Westeros for a number of reasons anyway, and, what's more, some of the symbols instead have eight spirals). Their presence in the caves suggests a different purpose: there, it was about the Children and the First Men coming together to fight the White Walkers. Could the spirals have had some kind of significance towards working together? Maybe, but since it was present when they made the White Walkers, and that was to defeat the First Men, probably not. And that's probably the best way to approach these symbols, really. They held a deeper meaning to the Children of the Forest, but what that was, has now been lost (and is something the prequel series might well explore further). Other religions have similar ritualistic symbols - this, like a lot of what we've seen about the Children, feels quite Paganistic - and it might not mean anything more than that, at least where this show is concerned. All it really means, and all that really matters, is death.